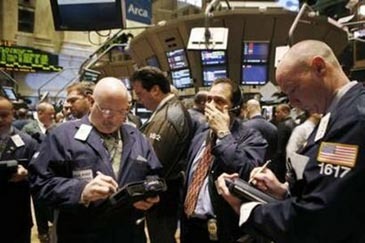 Wall Street plunged at the opening of trading on Jan,22, propelling the Dow Jones industrials down more than 300 points after an interest rate cut by the Federal Reserve failed to assuage investors fearing a recession in the United States. U.S. markets joined stock exchanges around the globe that have fallen precipitously in recent days amid concerns that a downturn might spread around the world. Treasury bonds were mixed, with investors seeking safer investments as stocks plummeted. The price of oil, meanwhile, fell amid expectations that a downturn would depress demand for energy. The Fedss decision to cut its federal funds rate to 3.50 percent and the discount rate, the interest it charges to lend directly to banks, came a week before the central bankss regularly scheduled meeting, a sign that the Fed recognized the seriousness of the world financial situation. But there were already fears in the markets before the Fed move that an interest rate cut wouldn't be enough to prevent a recession. In the first hour of trading, the Dow was down 311.99, or 2.58 percent, at 11,787.31. The Dow was last below 12,000 in March 2007. The broader Standard & Poor's 500 index was off 32.48, or 2.45 percent, at 1,292.71, while the Nasdaq composite index fell 64.35, or 2.75 percent, to 2,75.67. It was the first time the Fed altered the target federal funds rate between scheduled meetings since the markets reopened after the Sept. 11, 2001 terrorist attacks. The cut was the biggest one-day rate move by the Fed since it lowered rates by a full percentage point in December 1991, when the country was trying to emerge from recession. The Fed said in a statement that it took the steps to address a 'weakening of the economic outlook" and 'increasing downside risks to growth."' The bank also said it will act in a timely way to address future risks. "They seemed to react to the markets rather than anticipate the markets, but they did the right thing," said economist Edward Yardeni, who runs his own research firm. It’s been a black year so far for stocks. The S&P 500 index, the broadest measure of the stock market, has suffered its worst annual start ever, giving up about 13 percent in just three weeks. The Dow is down about 12 percent since the beginning of the year, and the Nasdaq is down approximately 15 percent. The yield on the benchmark 10-year Treasury note, which moves opposite its price, sank to 3.53 percent from 3.63 percent late Friday. Crude oil prices tumbled $2.38 to $88.19 on the New York Mercantile Exchange on the concern that a weak economy will dampen energy demand. The prospect of a U.S. recession dragging down the global economy has infected markets around the world, which plunged on Monday — when Wall Street was closed for Martin Luther King Jr. Day.